As a convicted witch, she's at his mercy. 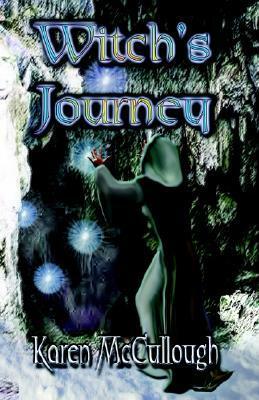 When Jinissa uses magic to save a child from a bad fall, she reveals herself as both a Calavrian witch and a spy. Jinny is convicted of witchcraft and condemned to torture and death. Before the sentence can be carried out; however, Lord Stephan arrives, announcing that the king wants to question the witch himself. A long trip over the mountains gives Jinny and Stephan time to get to know each other, and despite Stephan's well-founded hatred for her people, they begin to fall in love. But Stephan is loyal to his king, and Jinny is determined to escape. She's sworn to keep her people's secrets, even though she will never be welcomed back in her own country. And how can they afford to fall in love when it's certain that if Jinny doesn't escape, Stephan's king will be forced to kill her when she won't give him the information he seeks? Karen McCullough's first novel was published in 1990. Since then she's had many more published, ranging from mysteries to romantic suspense, to fantasy and paranormal. I gave this book 4 stars. It was a book that I couldn't put down. It was an easily predictable book, but it was a predictable book that was written well and I can't fault it too much for that. The main character had all the reason to be mean and hateful, she had the tragic backstory nessecary for all fantasy novel protagonists, but she wore her past well. She didn't let it define her in any terrible way, she worked with what she had and still managed to be a good person and to not be incredibly annoying. I liked her. The book felt good while I was reading it. The plot and the characters weren't confusing in anyway, I could easily follow along with what was happening, I never had to skim read because I was bored by anything that was happening either. It was the perfect balance of action and emotion. The relationship between Jinny and Stephan didn't feel forced. It started out as any other hate to love relationship with the two not really seeing eye to eye, but the chemistry never felt forced. And while this was hate to love there was no bickering or fighting between the two, merely misconception on Stephan's part. Being who she was, Jinny was his enemy and he wasn't going to trust her. I enjoyed how their relationship developed throughout the book. Although the book wasn't very long it still had a lot of development of the characters and the plot. Stephan wasn't a stereotype. He was a knight, the best friend of the king, but he wasn't a snob or mean. Stephan was a perfect gentleman who had his own terrible past that rivalled Jinny's. Even when Stephen hated Jinny he still treated her like a human being because he wasn't cruel. I couldn't help but root for the two of them to make it through everything and finally be together. The magic in the story was pretty basic, nothing abnormal, which actually helped in my understanding of the magic system. The author didn't really try to implant and unique or complex magic ideologies into the story. I didn't really mind, but if you always want something different in your fantasy books, this is probably not the one for you. OOOh. This isn't something I'd typically read, but your thoughts are intriguing.